The 17th century was in the history of Spain a stage of contrasts. Brilliance and misery, summit and decadence gave to themselves appointment in the course of the century. The height of the arts and the letters contrasts with the economic, political and social situation of the 17th century. A heap of juridical disparities and of fortune they were defining the society constructed in a stratified system. The social arch was including from the aristocracy of the big owners up to the simple laborers; in the end there were placing the underprivileged persons, beggars, vagabonds, crafty and knavish. The cleanliness of blood was establishing the difference between old Christians and new Christians; the last mentioned descendants of Jews or Muslims were remaining excluded from different institutions and groups. In the Spain of the 17th century the Church was exercising a great influence and was present in all the orders of the social life, since it was playing the pastoral, welfare and educational functions. From the birth up to the death, the Church was protecting the life of the individuals. The faithful Catholics beside fulfilling the ecclesiastic rules were in the habit of belonging to one or several fraternities or confraternities. In the same way that the individual, the collective life was remaining penetrated by the religion and it was served by the ideas, the rites and the religious buildings. The external manifestations were constant: processions, chimes of bells… The ecclesiastic institution was attending to hospitals and lazarettos; it attended the prisoners and dealt with the foundling children. The order of the Pious Schools and Jesus’ Company they developed a notable activity in the field of the education. 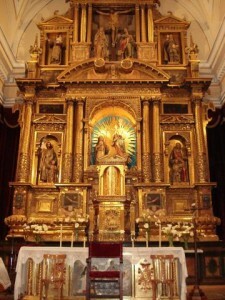 The Spanish Church was possessing abundant material resources. The principal source of his income was the tithe of the agricultural and cattle products. It is calculated that at the end of the century it was possessing a sixth part of the cultivable lands, besides estates and real properties, fruit of purchases, legacies or donations. 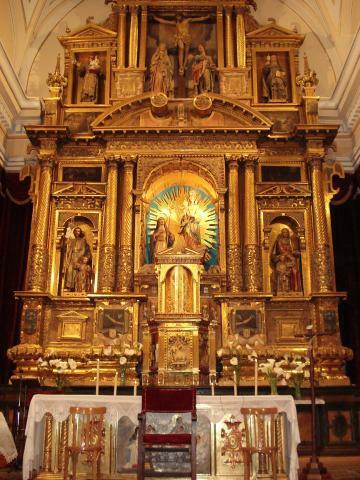 Inside the ecclesiastic patrimony there were included works of art, jewels, artistic objects destined for the worship. The ecclesiastic goods were used by the State, which obtained for them, tax concessions: the subsidy and the royal thirds. Along the 17th century there increased the ecclesiastic population, who was forming a heterogeneous set. The belonging to the clergy was not determined by the priestly ordination; the simple tonsure was sufficient. The exemption of taxes, the ecclesiastic jurisdiction, the social and economic support that was offering the Church in a situation of crisis … they favored the ecclesiastics’ recruitment. For the daughters without grant of the nobility and for single women or widows, the cloister constituted the unique refuge. The clergy was presenting an unequal territorial distribution, so that wide zones were turning out to be little evangelized. Urban nucleus like Toledo, Salamanca, Madrid and Seville were consisting with great number of convents and parishes. The clergymen preferred to establish themselves in the cities, where there were more resources, to the detriment of the rural world. Bishops and Canons of churches cathedrals and schoolboys were representing the sector of the educated clergy, with economic possibilities, opposite to the low clergy: parsons, small beneficiaries and chaplains. This group of social humble origin had modest income and a low level of instruction. The differences inside the Church also were visible in the ecclesiastic map. The reforms of Philip II in the 16th century did not solve the variations of extension and richness between the dioceses. The most forceful was Toledo, followed distantly by Seville, Zaragoza and Cuenca; in last place were Almeria and Mondoñedo. The kings of Spain were exercising the right of provision of bishoprics due to the royal patronage, which was awarding a heterogeneous set of prerogatives on the Church. The 17th century Teresa knew the inheritance of the mysticism lived in times of Saint Teresa and of San Juan of the Cross. In turn, new nucleus of illuminated ones appeared in Andalusia, especially in Seville; while the universities of Salamanca and Alcala were receiving Jansenio’s presence. There spread the reading of the Spiritual Guide of Michael Molinos, who catalyzed the movement called quietism. In these circumstances, the Spanish Inquisition defended the orthodoxy opposite to the deviations of the thought and of the religious practice. Its actions affected the converted Jews come from Portugal and the circle of the illuminated ones. The convents of religious where there had taken place phenomena of mystical character attracted the attention of the Holy Office; a significant case was that of the nun of Carrión. The Court of the Inquisition prosecuted also the witchcraft and, in another order of things, the bigamy and the scandalous conducts. The Theology knows in the 17th century part of the legacy of the golden age of the Spanish theology, at the same time as it contemplates already its decadence, decline that coincides with the progressive final of the Empire. On the contrary, it is the century in which we are present at the summit of the Scotus School. In the 17th century it takes place the birth of the Mariology as autonomous discipline inside the Theology. Among all the privileges of the Mother of God, the one that was occupying more the attention of the theologians it was her Immaculate Conception, already considered by itself, or in relation with other questions involved in it, for example, that of the debit, Maria’s predestination or her redemption for Christ’s merits. There was discussed already also on if it was definable truth or not, or what dogmatic qualification was convenient for it. Kings, theologians and the same Christian people was looking for the definition “ex-cathedra” and they were waiting for her ardently. But the spirit that was encouraging this environment was polemic. We know how on September 8, 1613 in the Reigns of the Angels of Seville convent a Dominican preacher manifested in opposition to the ” pious sentence ” and there was such reaction of the whole people, as well as the festivities that were organized in Seville and all around Spain from January, 1615 until the year 1617 in honor of the Immaculate Conception. The polemic spirit was manifested also, on the one hand in the attempt of suppressing the title of “Immaculate Conception”, as it appears in the decree of the congregation of the Inquisition of 1624; for other one, in the “vote of blood” in favor of the Immaculate Conception. As soon as the Purest was already and admitted truth almost by all, the theological disputes ignite now on other questions related to it: the debit of original sin and the redemption of the Virgin, they were the star topics.